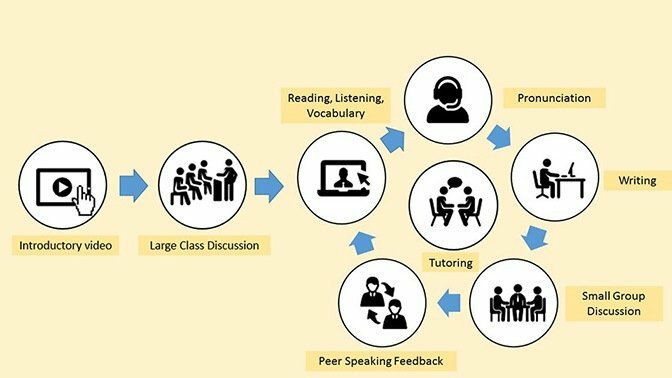 This article details the method and results of blended learning at EC English schools in the winter and spring of 2016. EC English is a group of schools within the language travel industry that teaches English as a Foreign Language (EFL) through a full immersion, continuous enrollment model. EC operates 24 schools across 5 countries including the US, Canada, UK, Malta, and South Africa. Around 40,000 students from 140 countries come to one of these centers each year to study English. Students take courses ranging from 1 week to a full academic year, with an average length of stay of 6 weeks. 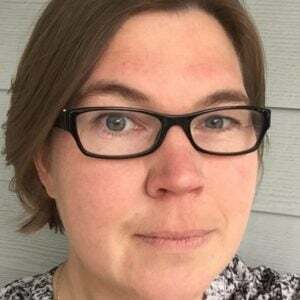 The typical EC student is in her mid-twenties and comes to EC in order to enhance her career prospects, further her educational goals and/or have a global experience. In February 2016 I designed blended learning pilots that ran over a period of two months in Boston, LA, and San Francisco. The aim was evaluate the efficiency and feasibility of teaching English in a blended learning environment. To measure the results of implementing blended learning at EC English, we gathered learning progression data, student satisfaction scores, and evaluated the user experience of a rotational blended learning model and the quality of the online learning tools. A total of 55 students participated in the study. 39% of the 50 students were from Asia, 25% from Latin America, 22% from the Middle East and North Africa, and 14% from Europe. Their ages ranged from 16 - 65, with 57% in the 19 - 24 age bracket. The students spent an average of five weeks in the blended class. Student learning progression was measured via an entrance, midpoint, and exit test identical to the test used for regular classes. The test evaluates students’ use of English (including conversation, grammar, listening and reading comprehension), writing and speaking on a scale from 0 - 100. All the parts are automatically corrected, except the writing and speaking tests. The students filled out a total of 3 anonymous surveys in the beginning, middle and end of the pilot answering questions relating to the learning environment, the online tools, user satisfaction, and suggestions for improvement. As part of the surveys we collected the students’ Net Promoter Scores (NPS) for their previous class and for the blended class. NPS is an index ranging from -100 to 100 that measures the willingness of customers to recommend a company's products or services to others. It uses a scale of 0 - 10, where 0 - 6 are considered detractors, 7 - 8 passives, or neutrals, and 9 - 10 promoters. The NPS is calculated by subtracting the percentage of detractors from the percentage of promoters. We were able to gather complete learning data and surveys from 80% of the students. The students spent two sessions, a total of 6 hours per week, in the classroom practicing reading, writing, speaking and listening, and three sessions, a total of 9 hours per week, in the computer lab. For the lab portion I chose a station rotation model, where the students rotated between five different stations where they practiced conversation, writing, pronunciation, grammar, reading, listening, and vocabulary for 20 minutes per station. A total of four online learning providers were used, selected based on their capacity to provide an engaging, high quality, and user-friendly learning experience in the targeted skills. Each day in the computer lab started with the students’ individually watching an online, interactive video covering an aspect of the theme of the week. They answered embedded questions on different aspects of the video using the online tool Zaption (no longer available). This was followed by a class discussions on the video and the weekly theme. Zaption allows the teachers to survey the students’ typed answers in real time, which permitted them to immediately address any questions and misunderstandings, and to tailor the discussion to the students’ demonstrated interests and challenges. The students then started working through the online stations in groups of 3 - 4, each starting at a different station. At the first station students completed vocabulary, listening, speaking, and reading exercises adapted to their level in the online learning program Learn Social by Knowledge Transmission. At the second station the students practiced pronunciation with the help of Native Accent by Carnegie Speech. This automated, adaptive tool creates a personalized learning path for each student based on their native language and their demonstrated pronunciation difficulties. At the third station the students practiced writing, again with the help of an automated tool that generates feedback, Criterion, by ETS. Station four promoted small group discussion where the students used teacher-created material to discuss an aspect of the week’s theme. At the fifth and final station the students again used Learn Social, this time for peer evaluated speaking practice. They recorded themselves answering a question prompt, listened to and gave feedback on the speaking submissions of their peers, and revised their own submission based on this feedback before sending it to the teacher for additional feedback and grading. In addition to these learning stations, the students were offered personal tutoring sessions focused on developing meta-cognitive skills in order to review their progress and find strategies for moving forward. On the final survey 73% of the students said they learned a little more, or a lot more in the blended class compared to the regular classes. Their statements were substantiated by the collected learning data, as well as the percentage of students who graduated to a higher course level compared to their peers in a regular class. The NPS scores also increased substantially throughout the trial period. Over an average of five weeks the blended students’ improvement between the entrance and the exit test was 9 points, compared to an average score increase of 3 points for the students in the control groups during the same time period. The control groups consisted of students at the same levels in the regular program from EC’s schools in Manchester and LA. The students in the blended program thus outperformed the students from the control group by an average of 6 points. The students in the blended program in LA advanced the fastest, with an average of 10 points improvement in five weeks. Ironically, their peers in the standard program at the same school advanced the slowest, with an average of 2 points. 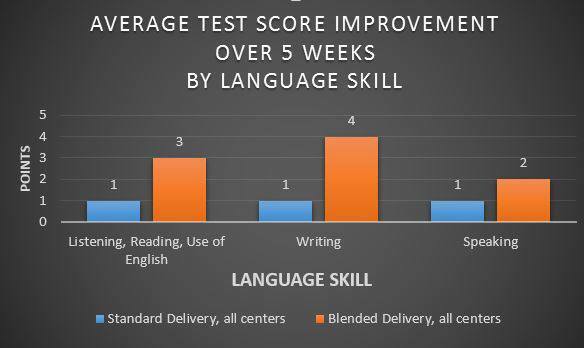 When divided by language skill the biggest difference was seen in writing skills, where the students in the blended program obtained an average of three points more than the students in the standard program. We did manual blind checks of the grading for the standard and blended students' writing scores to rule out teacher bias. The results showed no difference on average for the blended learning students compared to the initial scoring. For the standard students the test showed the reviewers gave one point less than the teachers on average. Based on this, bias toward the blended learning students is unlikely the reason for their superior performance in writing skills. EC students are considered eligible to advance to a class at a higher level if they obtain a compiled test score of 70 or above. After an average of five weeks, 51% of the students in the blended program were eligible to advance, compared to merely 22% of the students in control groups. The NPS scores also improved at all the centers. 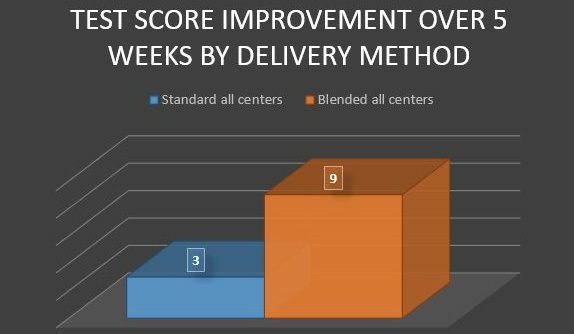 Over an average of five weeks the average improvement across the three centers was 45 points. The LA scores improved the most, by 91 points. 95% of the students found the class always, or almost always fun and engaging. In addition, 92% of the students in the focus group preferred a blended class to a traditional class. The students especially appreciated the possibility to work at their individual pace and to practice all of the language learning skills every time they came to the computer lab. They felt the class was fun and dynamic, that the material was adapted to their individual level. The teachers were also mainly satisfied with the experience of teaching the blended class. In particular they appreciated the noticeable acceleration in student learning, especially for students whose improvement had previously stalled. They also felt most students were focused and engaged with the programs. In addition, they appreciated the flexible nature of the learning environment, the possibility to try teaching in a new way, and to try out new tools and approaches. However, both students and teachers pointed out there was still some room for improvement. The students felt there was a lack of peer and student-teacher interaction in the class, that the speaking and grammar practice provided was insufficient, and they felt the Knowledge Transmission learning tool was not sufficiently engaging. They also expressed the preference to spend more than 20 minutes on each learning station. The teachers felt the frequent technical issues were frustrating, and suggested an update of hardware and software before running the blended class again. They also requested additional training for teachers on programs as well as technical troubleshooting, in addition to a more streamlined student onboarding process. Blended learning at EC English showed a blended learning environment is an efficient and appreciated addition to the second language classroom. When traditional face to face learning is blended with the flexible and personalized nature of online learning students are engaged and learning enhanced. Indeed, all the predetermined measures for success this pilot were met and exceeded: the students learned more than two times faster than in the standard program, and the student satisfaction score increased considerably. These results strongly point to the desirability of developing and running blended courses in EFL classrooms, and in continuing to research the best practices for blended foreign language learning.